Rascal Flatts + Taylor Swift = Happy Awesome! Do you see that last one? That was Saturday night. It was awesome! Natalie, the Thelma to my Louise….without all the guns and cops, though…was my date for the concert. Peter couldn’t be here to go, and really isn’t right in the head a huge Rascal Flatts fan and why would I waste a FREE TICKET! on him if he isn’t aching at the seams to see them? Natalie, however, was. Oh yeah, you heard that right, our tickets were free! Can I hear a big WAHOOO for Jenny and Travis of US 103.5, one of our local Tampa stations that stepped up and smacked one out of the park for Natalie and myself! A long story short, Jenny is a friend of a friend and started reading our website…I got the chance to meet Jenny and Travis when we did a tour of their studio and Jenny recognized Peyton….a desperate plea casual comment about tickets for the upcoming RF concert was made and they made this night happen for us. Yeah. That’s right. That’s pretty darn cool! Thank you so much to Jenny and Travis because Natalie and I? We had a wicked fun time! And at $85 a ticket, it wasn’t something we would have ever been able to do for ourselves, so thank you thank you thank you. Taylor Swift was the opening act. Once I get past the fact that the girl has made more money before graduating high school than I will see in my lifetime, she put on a rockin’ good show. The people behind us were all “Encore! Encore!” Which is funny because 1) you generally don’t encore the opening act and 2) she only has about 6 songs so what’s she going to encore with? But give her a few years, that girl is going to be making some mad music magic because she is adorable and talented and I wanted to wrap her in a blanket, sneak her home and keep her like a pet bunny. 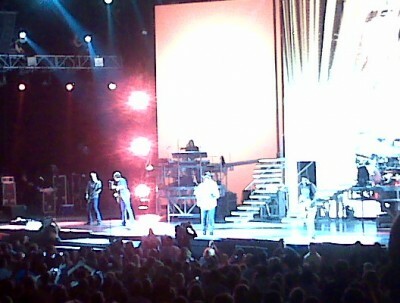 It was a sold out show at the Amphitheatre, which meant hours and hours in the oppressive Florida humidity and heat. It was so worth it. Rascal Flatts blew the roof off the place, they put on a tremendous show of how funny and gifted each one is, the amazing musical talent they posses and what awesome showmen they are. There was only a slight glitch in the night when the band started up the song Skin and Natalie and I had both prepared for hearing it, yet we both burst into tears. FYI for those who don’t know, it’s a heartwrenching song about a girl who gets cancer, loses her hair and her boyfriend shaves his head for the prom. Pretty simplistic description for a song that tore our hearts out and stomped them into teeny bite sized pieces. **sorry for the broken linkage, all fixed now. Truly, I have to tell you that one of the highlights of my night was the crazy enthusiastic woman sitting to my right. Not Natalie, she sat to my left. Ms. Right was super excited to not be sitting in the lawn seats (which she had every right to be, we had really great seats), thrilled about all the free stuff she’d collected (cause, really, who can’t use more beer cozies, bottle openers and shirts advertising Copenhagen “even though I don’t chew anymore, ya’ll”) and was WAAAY too into telling me all the details of her life: like how she is the person all her girlfriends send over to get numbers from strange guys when they’re too shy to go themselves, and sometimes…just a few times…she’s set up hotel rooms for them too….because that’s what friends do. They set up hotel rooms for you to meet up with your soulmate when you’re too nervous to call the local Motel 6 and tell them to leave a light on for ya. She went on to share more information that I didn’t want and couldn’t seem to stop her from spilling…their trailer, their car, her daughter’s boyfriend she doesn’t like. I nearly promised to run to the van to get the free beer coozie I had left out there if she promised to just ZIP IT during the music. It was a small price to pay to get to enjoy this FANTABULOUS concert. So, thank you to all the great people who made this outing possible. Travis and Jenny from 103.5, our fairy-ticket-parents, who made two cancer moms verrry happy tonight, Ronnie and Alannah Willis who took the 3 Mayhew kids into care so that I could steal Natalie away for the night…again. And to Rascal Flatts for being one of my all time favorite bands AND sounding every bit as good live as you do recorded. Why yes, Rascal Flatts, I WOULD drop everything and go on tour with you! Posted in: events and happenings, Mayhew niblets, picture fun, We like to party. Sounds like an awesome night! Glad you had so much fun! 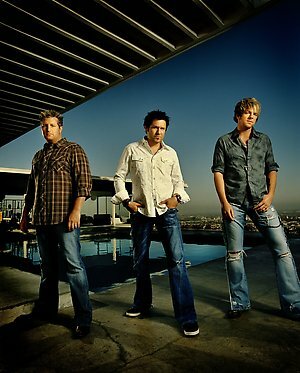 I saw them about two years ago (Rascal Flatts, of course…Taylor was too busy with high school at that time). They were fantastic then too! I’m glad you & Natalie got to go! What a GREAT night, huh!?!? I had one of ‘those ladies’ behind me as well. As she was gyrating to the music, she fell into Shawn T. and pulled her hair. Shawn turned around and said “I will CUT. YOU. if you do that again” … it was SO funny. I’m going to pass on watching the video again because you know what will happen to me!!! But if you and Peter are ever in need of a hotel room, I’d be happy to set one up for you because, ya know, that’s what friends do!!! LMAO!!! I can understand why that song goes straight through your heart. WOW! Thanks for point that out. It is so difficult to get it nowadays. taylor swift has a warm sweet voice. she is also a very beautiful person.